Pro Cantione Antiqua - Bruno Turner, dir. & The Early Music Consort of London - David Munrow, dir. ,-,  Pro Cantione Antiqua London [James Bowman (countertenor), Keith Davis (countertenor), Paul Esswood (countertenor, John Elwes (tenor), James Griffett (tenor), James Lewington (tenor), Brian Etheridge (bass), Michael George (bass), David Thomas (bass)] - Bruno Turner, dir. 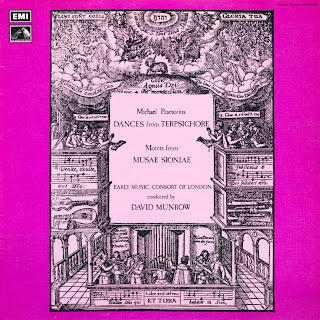 , , , -, ,  The Early Music Consort of London [David Munrow (crumhorn and pommer), Roger Groves (tenor trombone), Martin Nicholls (bass trombone), David Corkhill (drum), John Donaldson (drum)] - David Munrow, dir. CD: BMG/Deutsche Harmonia mundi GD 77 178 QR - Adieu Madame - Musik am englischen Hof (ca. 1415-1530) Music at the English Court (ca. 1415-1530). ,  Deutsche Harmoni muni (BMG) 05472 77601 [CD] Century Classics I 1400-1500: Dunstable - Dufay et al. Comments: One of the last Munrow's LP, released two months prior to his death. Image below is from Amazon. German edition.